Posted on January 7, 2014 by Danielle K.
As the holidays come to an end, I search for every way I can possibly find to prolong the season. I decided to read this book due to its dependable authors and captivating book jacket. Let It Snow is a three-story compendium of interconnected Christmas narratives written by John Green, Maureen Johnson, and Lauren Myracle. The first story is “The Jubilee Express” which is my personal favorite, and follows a girl named Jubilee as she is spontaneously ordered onto a train on Christmas Eve, which unfortunately crashes into a snow drift. Her decision to get off the train and take refuge in the Waffle House nearby kicks off the elaborate series of unexpected events that prevail throughout the rest of the book. Jubilee is relatably awkward and unadulteratedly hilarious. She narrates the story in a unique, strange, and universally enjoyable style. The second narrative is called “A Cheertastic Christmas Miracle” and is written by the modern king of young adult fiction, John Green. It tells story of Tobin and his friends as they journey through a blizzard to the proverbial Waffle House in pursuit of cheerleaders and hash browns. The third story, “The Patron Saint of Pigs,” is the tale of an aforementioned girl named Addie, who aims to become less self-absorbed and sets off on a quest to a local pet store to pick up a previously paid for, teacup piglet for her friend, just as she promised she would. In this last part of Let It Snow, Lauren Myracle presents readers with a flawless, wrap-up conclusion to the novel in which all characters are united in one satisfying and intriguing resolution. There are not very many authors that could possibly amalgamate a Waffle House, a Starbucks, a Tinfoil Guy, a notorious cheerleading cult containing an abundance of Madisons and Ambers, James Bond, a female Duke, tangential Swedishness, Twister, ceramic Santa villages, a girl infamous for her hash brown addiction, a celebratory Smorgasbord, and a dedicated Target employee to form one seemingly sane, unified whole, but that is exactly what these three authors came together and succeeded in doing. Let It Snow consists of humor, relatable teenage drama, reflection of life, captivating stories of love and of friendship, and the substantial difficulties and benefits of human relationships. One reoccurring issue that is addressed throughout this book is the contemporary corruption of the social paradigm. The entire wholesome social hierarchy is solely based off the disregard of common equality (e.g. the drama geeks are cooler than the band nerds but buried under the social appreciation for jocks and cheerleaders). I found this both true and amazingly appropriate for the designated audience. 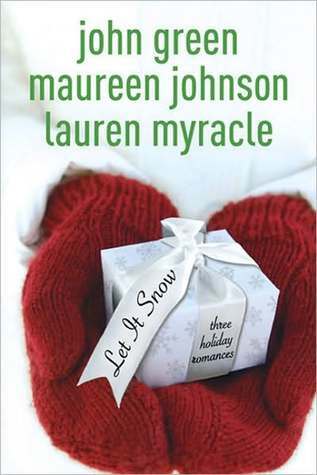 If you liked The Fault in Our Stars, Paper Towns, or any of Maureen Johnson’s books or Lauren Myracle’s novels, you’ll love Let It Snow. This entry was posted in Book Reviews and tagged contemporary, holidays, humor, john green, lauren myracle, maureen johnson, realistic, romance by Danielle K.. Bookmark the permalink. This seems like a interesting elaborate story. Can’t wait to check it out. I read John Green’s Paper towns, and it was awesome, so I might want to read this, especially since the second story sounds like it is very hilarious. You sound like a potential nerdfighter. I’ve read all of his books and I suggest you read (at least) An Abundance of Katherines and THE FAULT IN OUR STARS. I also recommend that you check out his youtube videos. This is one of the few books by John Green that I have yet to read and it sounds really interesting! Great review!